Doughty has added a set of new and stronger truss adaptors to its existing range, offering riggers a wider choice for theatre rigs and outdoor events. 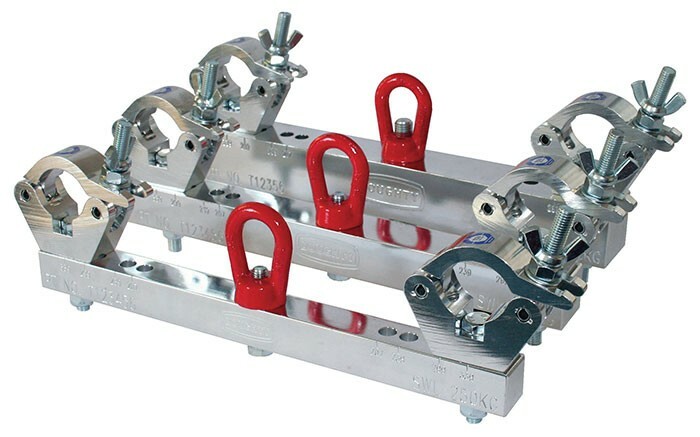 The new adaptors are made from solid, high tensile aluminium and fit all major brands of triangular and square truss, enabling it to be lifted into place safely and securely. With a choice of three hanging sizes – 250, 500 and 1000kg – the new truss adaptors are fitted with slim line clamps. The 250kg size is available as either a fixed or a swivel version and comes ready fitted with a 28mm Euro spec spigot. As with all Doughty branded products, the new truss adaptors are manufactured in the UK and available for immediate shipping. The German entertainment industry is Doughty Engineering’s biggest export market and continues to grow year on year. 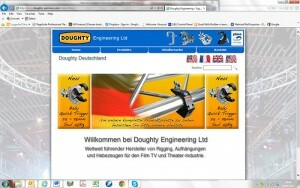 With seven distributors in Germany and one in Austria, Doughty has launched a dedicated German language website. In picture: new truss adaptors from Doughty and a screen grab of the German language website.